None of us want to see a kid break his or her neck. Especially not our own kid. On the other hand, none of us like to see a wimpy kid that's afraid of excitement. Especially not our own kid. Somewhere on the Parental Planet, between the North Pole of Recklessness and the South Pole of Paranoia, is an equatorial island called Healthy Balance. If you ever locate that tiny tropical paradise, email me the GPS coordinates. 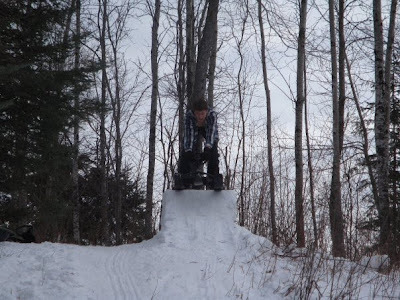 My teen aged son and his two cohorts made a jump on the sled hill last week. When Phillip assured me that it wasn't "too big," I instantly felt myself swing toward the South, but being the level-headed, firefighting dad that I am, I decided to at least go have a look. As I feared, his version of "not too big" was slightly smaller than an Olympic ski jump . . . you know, the kind where they hurtle straight down at 300 miles and hour, then rocket straight up, three miles into the air. So, what did I do? 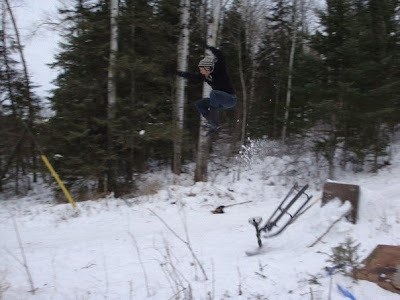 I helped him put some finishing touches on it, and reminded him that a broken leg would put a severe damper on skiing in February. 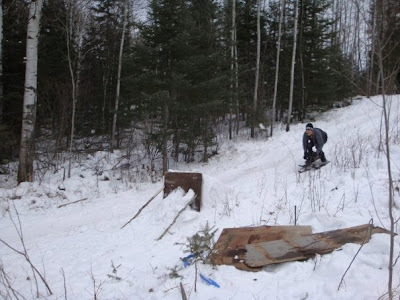 To prove I'm not exaggerating, I've included some shots his buddy took of Upsala Olympic Sled Jumping. First, here is cohort 1 on the starting ramp. 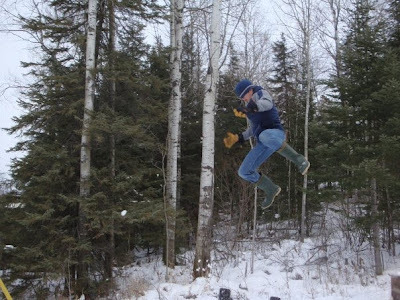 Here is Phillip, approaching the jump. And here he is on the brink . . .
. . . and now he's flying through the air. 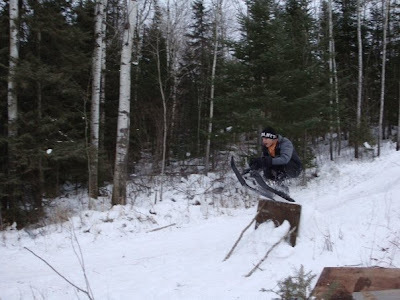 In case you are wondering, this is Free Style sled jumping . . . which means you make up the style as you go. This is Cohort 1 making the leap. 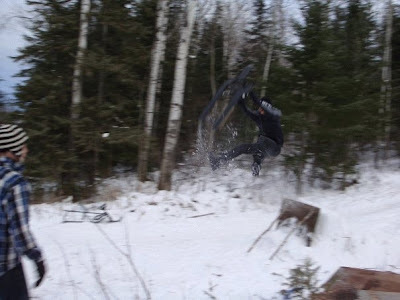 Cohort 2 landed somewhere near the Manitoba border. I repeat, if you find those GPS coordinates, email them to me. Speaking of crazy people, I found the Los Angelos dog rescue video. In case you were wondering, guys that dangle from helicopters are the same ones that built Olympic sled jumps when they were kids. That guy's dad probably phoned later to congratulate him, and subtly remind him that a broken neck would put a severe damper on water skiing in February. I think they water ski in California in February.